The Keyword Overview is our top-level report that can be generated for any search engine keyword in the SEMrush database. After entering your word or phrase in the search bar you’ll see the keyword’s volume, number of results, CPC, Competition level, trend, and more. Portal to deeper keyword research reports in the software. What’s a keyword? It’s the voice of your potential customers. Web searchers use keywords to verbalize their problems or express their interest in a specific topic. In digital marketing, keywords are the intersection of you and your potential customers. You can target them organically with your website or through an advertising budget on Google Google Ads or Bing Ads. But before you can bring in any traffic from search, you need to decide which search terms are worth pursuing and trying to rank for. This is where keyword research becomes so important. The Keyword Overview report is the easiest place to start your keyword research and grow familiar with SEMrush's reports and metrics. When you launch a Keyword Overview report, SEMrush will provide you with all necessary information for an initial assessment of a keyword’s value. Volume: the average number of search queries per month for the queried keyword over the last 12 months (on the national level). Knowing search volume allows you to estimate how popular a keyword is. High-volume search terms are great for driving a lot of traffic. These are often called “body” or “short-tail” keywords and consist of only a few words. However, the more popular a keyword, the more competitors will want to be visible in its search results. So, the higher the search volume, the harder it is to overrun your competition. For example, let’s say you are a local electronics store and are looking to gain an advantage over your competitors in the search results for keywords about the products your store offers. By using SEMrush, you are able to find additional keywords with competitive metrics that can help you determine if these keywords would be beneficial for you to target. If you notice that you are missing out on important search opportunities for your keyword list, SEMrush can show you the cost and difficulty of ranking for any keyword. SEMrush lets you see the important long tail keywords that you may not be targeting in your current SEO or PPC campaigns, but can make a huge difference in getting a leg up on your competitors. While it may have much less search volume per month, this keyword is valuable for an SEO strategy because it is so specific. With a more specific keyword, you can be more effective targeting searchers by providing super-specific content on your website. In contrast, “headphones” would likely be too broad and competitive of a keyword to effectively target with SEO. Number of results: the number of URLs displayed in organic search results for a given keyword. Trend: how much interest web searchers have shown in a given keyword in the last 12 months. A keyword’s trend helps you understand the seasonality of your target audience and predict when driving traffic with a particular search term will result in seasonal spikes. If you see that a keyword’s trend doesn’t peak and stays at the same level, then you’ll need to make sure that you're targeting this search query year round. However, if a keyword has a significant spike in the summer months (bathing suits, for example), then you would want to plan to write seasonal website content or plan a seasonal advertising campaign to target the keyword. SEMrush lets you see exactly when certain keywords are becoming more popular thus informing you of when is the optimal time for you to target. CPC: the average minimum price that advertisers pay for a user’s click on an Google Ads ad that popped up for a given keyword. If you’re in a database where the country uses another form of currency, open the drop down and choose your currency. If you are running or considering launching Google Ads or Bing Ads campaigns, a keyword’s CPC can help you understand which keywords are worth bidding on. CPC Distribution: the average price for a user’s click throughout different regional databases. Competition: the density of advertisers bidding on this keyword for their ads on the national level. A score of 1.00 indicates the highest level of competition, and a score of 0.00 indicates no competition. Although this metric refers to competitors in paid search, it can be representative of a keyword’s organic value as well. Having a list of metrics is helpful for initially estimating a keyword’s value. But the Keyword Overview report allows you to conduct even deeper keyword analysis. Read on to learn about more features! You will also see the top five phrase matches and related keywords (2) in the Keyword Overview report. Phrase matches are longer search terms that include the queried word within their phrase. Related keywords are common misspellings and topically related search phrases that trigger the most similar search results as your keyword in the search bar. These related keywords make for excellent keywords to target with PPC ads, as misspelled keywords generally have a lower CPC than the correctly spelled keyword. Please note: the Related Keywords report now lives within the Keyword Magic tool. The Keyword Overview report lists the top domains (3) whose landing pages pop up for the search term you are analyzing. If you find your website in this list, congratulations! Google considers your page one of the best and most relevant to the given keyword. But don’t miss the chance to strengthen and improve your ranking. Improving your search rankings organically can be the biggest factor when it comes to beating out your closest online competitors. Millions of searches occur in all kinds of markets on a daily basis, so getting your site up in the rankings will boost your day to day online visibility. Whoever is ranking currently on the first page of results are your SEO competitors. You can check each competitor’s web page and analyze its content, structure and usage of the particular keyword. Click the small arrow to open a page in your browser. 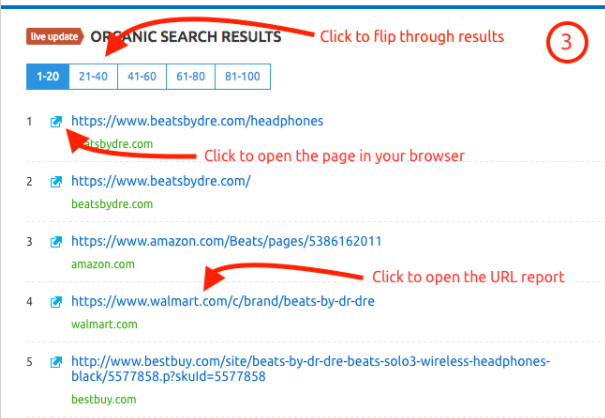 Or, click the URL to open the SEMrush URL Overview report and see what other keywords the page is ranking for, its backlinks and the share of traffic this page brings to the website. If you don’t see your domain among the top pages that rank for a particular keyword, you should analyze the content on the top performing pages. One of our Project tools, On Page SEO Checker, can help you generate ideas for improving your content. Tip: You can export each part of the report in XLS or CSV formats. If you’re not yet ranking in organic search results for a particular keyword, you still can drive traffic to your website by bidding on keywords Google Google Ads or Bing Ads. With the Keyword Overview report, you can also find the top text ads (4) that appear for a keyword in paid search results. Take these as inspiration for writing your own ad copy and analyze the landing pages they are pointing to. 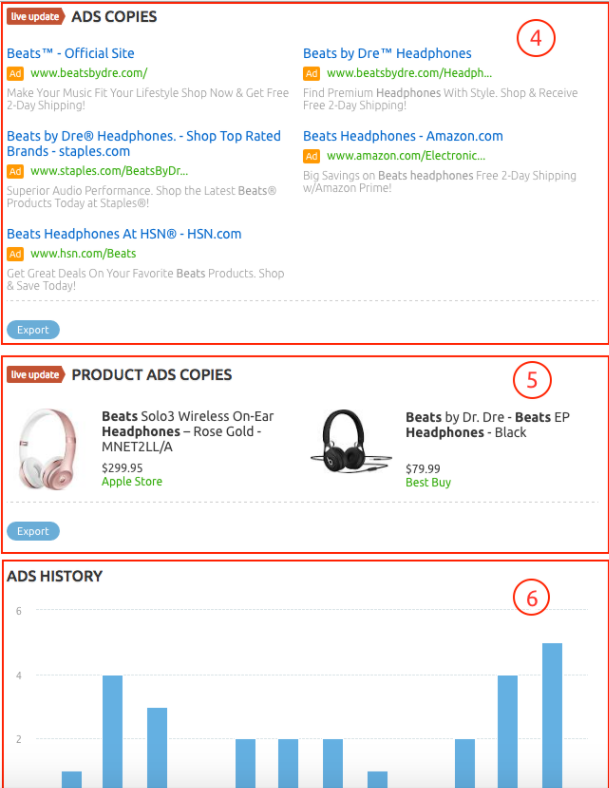 If you’re an ecommerce website, pay attention to the top product listing ads (5). These advertisers are your top Google Shopping competitors. Also, the Ads History widget (6) will show how actively websites were bidding on the keywords in the last 12 months on the national level. Click it and you’ll be forwarded to the Keyword Ads History report, which will give you detailed information. By using SEMrush Keyword Analytics you can determine your best performing ads over the past year. With this information you will be able to see which strategies are bringing in the greatest ROI and use this for continued success in your future search advertising. If you have already been using the analyzed keyword for your advertising campaigns, you can use this data for improving your ads’ search visibility. Now that you're comfortable querying a Keyword Overview report, be sure to check our the Keyword Magic Tool to dive even deeper into keyword research. Tip: To view historical data for a keyword, use the selector at the top.